NEW PRODUCT – 3×4 Right Angle Male Header – 4 pack « Adafruit Industries – Makers, hackers, artists, designers and engineers! NEW PRODUCT – 3×4 Right Angle Male Header – 4 pack. Three rows in a right angle header!? Yes! 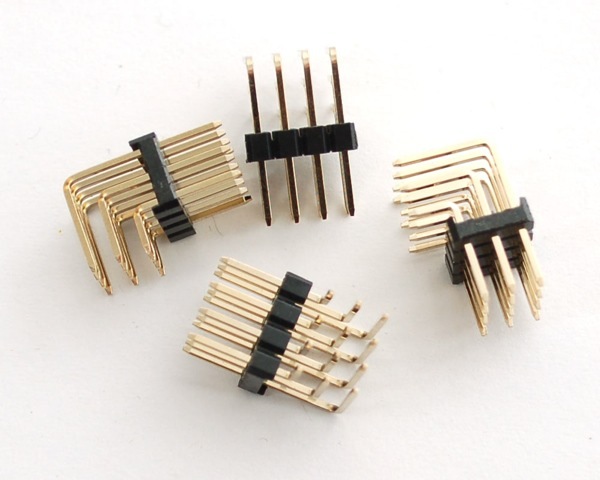 These chunks of 0.1″ header has yet-another-row – handy for when you want to connect cables that come in sets of three, like perhaps sensors, or servos. These plug into any standard 0.1″ spacing perf-boards or other PCBs and work nicely with our female-ended wire sets. Comes in a set of four pieces, each piece is 3 rows by 4 rows. You can stack these next to each other in any direction. We think these are a great addition to our 16-channel PWM/Servo driver breakout, so we have a photo showing them installed above.